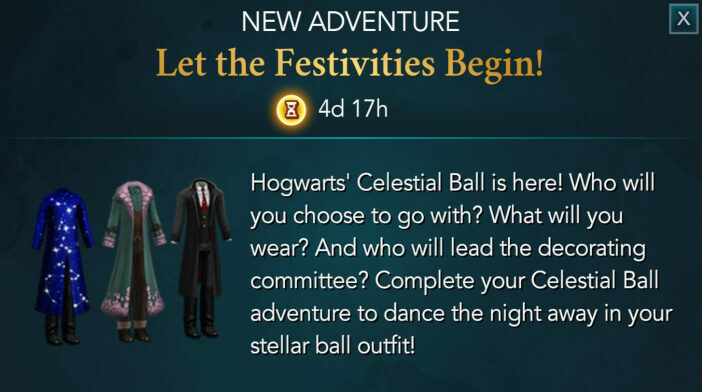 Hello everyone, welcome to our Walkthrough section for Let The Festivities Begin Adventure for Harry Potter: Hogwarts Mystery. This adventure is available for students of Year Four and above and as most others, it consists of four parts. However, this one is significantly longer than any other adventure available up to date, but thankfully, you'll have 4 days and 17 hours to complete it, which should be enough time. In this adventure, you'll learn that the Celestial Ball is approaching. You'll get the chance to join the decorating committee and help make the decorations for the ball. Other than that, you will be able to pick an astonishing outfit and most importantly, you'll get to choose a date for the ball! So, dive right into this lovely adventure full of fun and excitement!